The wolf population jumped 28 percent, including two new packs, an annual state survey shows. Wolves continue to prosper in Washington, with the population up 28 percent including two new packs, the latest annual report by the state Department of Fish and Wildlife shows. By the end of 2016 the state was home to at least 115 wolves in 20 packs, including 10 successful breeding pairs documented in surveys using airplanes, remote cameras, tracks and signals from radio collars. The year saw a net gain of at least 25 wolves in the state despite the deaths of 14 from various causes, including seven killed in the Profanity Peak Pack to protect ranchers’ cattle in northern Ferry County. The wolves are making a comeback from near extinction in the 1930s from trapping, poisoning and shooting. 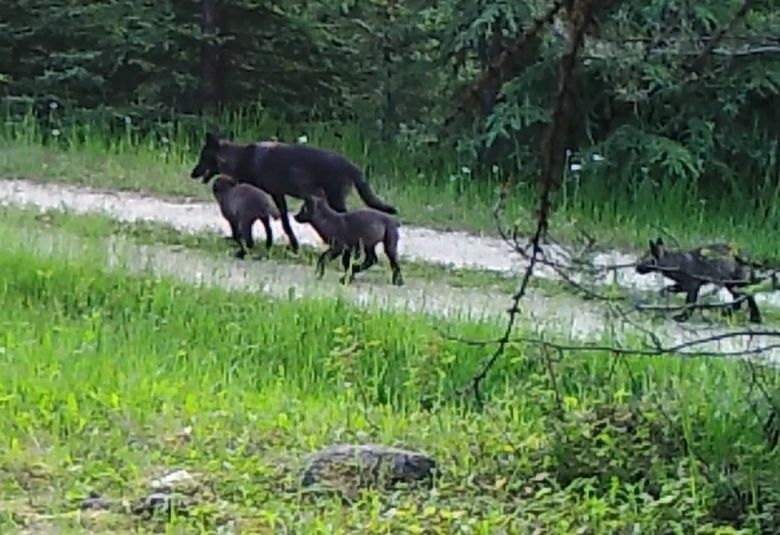 The first resident pack was documented in 2008, of animals that arrived on their own in Washington from neighboring states. The population of wolves, which are native to Washington, has been growing ever since. Last year was a tough and expensive year for the state’s wolf-recovery program, with more than $134,000 spent to kill the seven wolves in the Profanity Peak Pack. In all the department is budgeted to spend $5.7 million on wolf management in the biennium ending June 30. The state is still in the beginning stages of wolf recovery, and short of the goal in the 2011 state Wolf Conservation and Management Plan, which calls for 15 breeding pairs, geographically distributed. The Washington State Legislature and Wolf Advisory Group, assembled by the state Department of Fish and Wildlife, both are grappling with creating new policies to help the state achieve recovery goals. HB 2126 would create a new grant administered by the state Department of Agriculture to deploy nonlethal wolf-deterrent tools and strategies with ranchers through a newly created nonprofit. An advisory group consisting of local conservation-district officials in northeastern Washington would help direct use of the money from private and public grants. The idea is to use existing, trusted, local community networks to help build up acceptance of and adoption of nonlethal wolf-deterrent methods, said Rep. Joel Kretz, R-Wauconda, a supporter of the bill — and whose district is home to 16 of the state’s 20 wolf packs. The bill already has passed the House with no opposition and now heads to the Senate Ways and Means Committee. The state Wolf Advisory Group concluded work Thursday on a suite of recommendations to the department intended to embrace strategies in the coming grazing year. Changes recommended by the group this year would allow a swifter deployment of lethal removal of wolves, particularly in the case of an acute outbreak of aggression toward livestock. Fish and Wildlife makes the final decision on the policy, and its implementation. The goal of quicker intervention is to save more wolves and livestock. “The preference is to change the behavior immediately,” said Donny Martorello, wolf- policy lead for the state. The WAG also encouraged more use of nonlethal deterrents intended to stop wolf depredations on livestock before they happen. The department already is deploying nonlethal tools with ranchers in a program that is catching on so much the state could not meet all the demand last year, Martorello said. That includes flagging on fences, lighting and people on horseback and ATVs to keep wolves away from sheep and cattle. 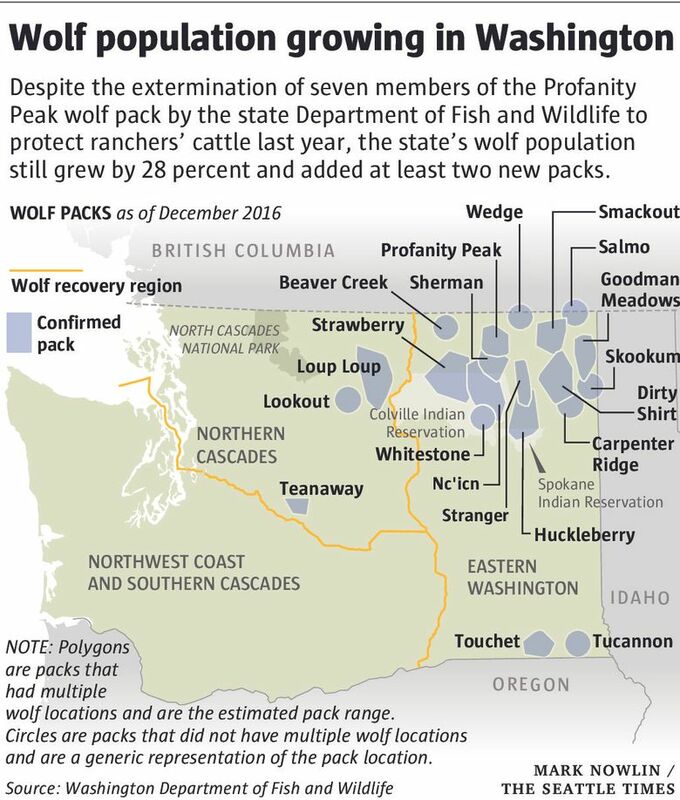 Most Washington ranchers have been able to coexist with wolves, but the state has moved to kill three packs preying on livestock: the Wedge Pack in 2012, the Huckleberry Pack in 2014 and the Profanity Peak Pack in 2016. Listed as a state endangered species everywhere in Washington, wolves also are federally protected in the western two-thirds of the state. While the goal is to be as proactive as possible to avoid conflict between wolves and livestock, no one should expect perfect peace. Arron Scotten, a fifth-generation rancher in Kettle Falls, said he wants to be able to turn his cattle operation over to the seventh generation in his family.